Appreciation Week 2016 is a collaboration between Raffles Press and Students’ Council that aims to recognize and appreciate the non-teaching staff members who do a lot that we often don’t value enough. Though we do not normally see them around, the impact they have on our school lives is indispensable. They seem to always be around: patrolling the gates, locking up our classrooms, even just around the school corridors. But students in RI hardly ever pause in their daily lives to talk to these guardians of our school, or properly appreciate what they do to keep our school intruder-free. 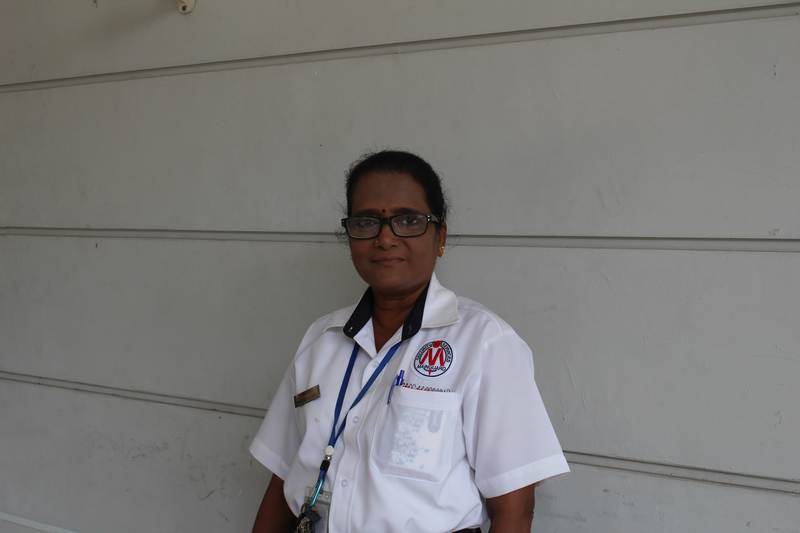 As part of Appreciation Week 2016, Raffles Press had the chance to speak to Mdm Mallika, one of the multiple security officers in Raffles, on the ups and downs of her life as a head of a team of security guards in RI. Like the other members of the Raffles community, Mdm Mallika starts her day at 8am, deploying her team of guards to their various duties around the school. As a supervisor, she ensures that the six security officers under her follow the duty roster, and fulfil said duties — these include locking and unlocking doors on time, and preventing trespassers from entering the school. Mdm Mallika is also in charge of the security of the entirety of the RI campus, and is the overall supervisor of every security officer we see here in school. This means that she has to be very responsible for those under her, a job that she performs with the utmost enthusiasm. The officers themselves work in shifts, rotating between patrol and the few main guard posts on the site, Gates 1 and 3, with the latter being the main gate, and where most visitors to the school enter and exit. Mdm Mallika tries to ensure fairness in her shift rotation, with the various officers changing positions every few hours: more, if they are stationed at the gates. Mdm Mallika has been working for RI since 2008. As an alumnus of RGPS, she feels an attachment to the Raffles family, having switched professions to join the RI security staff. Despite this, she has no regrets. “I get to oversee a hundred people, and I’m protecting a school. I’m very proud of working here.” Furthermore, working in RI certainly gives one opportunities to meet a variety of people. Mdm Mallika says she loves when RI hosts events, as she has the chance to encounter different parents or volunteers who come to visit our school. Such events are also a chance for her to appreciate the RI students, as some of them help to direct their parents to appropriate pick-up or parking areas to make the security guard’s job easier. Unfortunately, sometimes, it’s out of their hands when it comes to stubborn students. When such an occurrence happens, she and her staff take down the names of students to report their behaviour to the management. However, Mdm Mallika says that she mostly enjoys working with students, and is usually understanding of their experience as she remembers being a student herself. At the end of the day, it’s just simple acts that make her day working in our school. When asked what her favourite thing was about the students, she said that she appreciated when students bowed in greeting as they passed her. “Some, even if they don’t greet, they’ll put on a smile. But […] I like when they bow their heads,” she says with a laugh. Ultimately, Mdm Mallika feels that the most important thing is putting in your best work, and thinks that everyone should make an effort to do the same. Students’ Council will be setting up a booth in the canteen for students to write notes to non-teaching staff. Do come down to the booth and participate in this to show your appreciation!